AS TRAVELERS, we know that some destinations are more visited than others and we usually try to avoid them — who wants to spend their time surrounded by hoards of tourists all staring at the same monuments, visiting the same museums, and lounging on the same beaches? What we don’t necessarily think about is how much certain countries are relying on tourism for their economy. 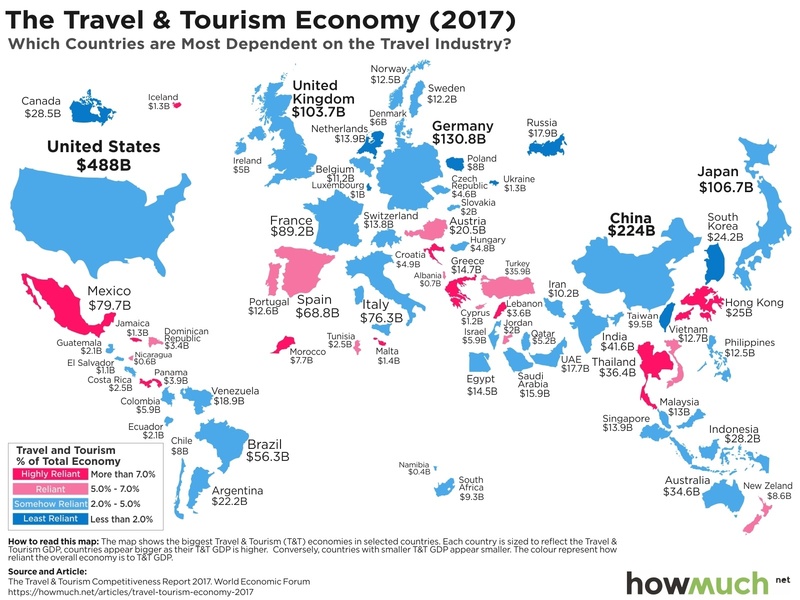 According to data that howmuch.net collected from The Travel and Tourism Competitiveness Report 2017, those with the largest tourism industries are not always the ones that are the most dependent on it. I was personally surprised that Austria depended so much on tourism and that France’s was not colored in pink, but what stuck me the most is Iceland’s dependency on the travel industry, “Iceland is one of the smallest countries by population in the world [but] it receives more visitors in one year than the entire population of the country,” explains howmuch.net. What surprised you about this map and this data? Let us know by leaving a comment.